Discuss dangerous situations which may happen at the swimming pool. 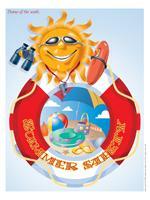 (Open thematic letter - Summer safety) Print.Prepare a bright envelope. Leave it in an easy to find location within the daycare. Have children find the letter and read portions of the letter to them each day. The pictures may be used as a memory game or to spark a conversation with the group. Use them to decorate your daycare or a specific corner. 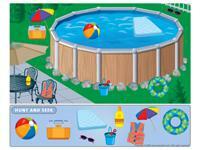 (Open picture game - Summer safety) Print, laminate, and store in a "Ziploc" bag or in your thematic bins. Have fun with these wonderful workshop ideas provided by Caroline Allard. They can be done indoors and outdoors. Small wooden logs children can use to build shelters, bridges, etc. If you have a bin containing motorcycles, they can be used for this theme! Red, yellow, and green construction paper which may be used to make traffic lights. Use an empty paper towel roll, dried peas, and a few nails to make a rain stick. Make your own windmill toy! Use plastic bags and a few sticks to make kites. Stamps representing elements of nature. You may organize an area "like at the pool". Include a small inflatable pool (with or without water), life jackets, swim aids, water toys, and foam noodles. Use this area to inform children about the rules they much follow when swimming. Set up another corner which for everything "on wheels". Include an adult bicycle, rollerblades, tricycles, helmets, knee protectors, etc. Parents may add to your corner. Remind children about bicycle safety. If you wish, add tools, sponges, and a pail of water children may use to "fix" and clean bicycles. Make your own "countryside" area. Add an empty bottle of bug repellant, a citronella candle, a bee helmet, a boat made out of an empty cardboard box, fishing rods, life jackets, a fishing net, a crafted campfire, a picnic table, a tablecloth, etc. Talk about nautical safety (remain seated at all times, wearing a life jacket, etc.). Discuss bug bites too. Tell children what they can do to protect themselves. While you are on the subject, you can even discuss what we should do if we find dead or hurt animals. Another corner suggestion is a "first aid" corner. A first aid kit, a large quantity of bandages, blankets, pillows, and a doctor or paramedic uniform are great! Talk about all the little summer accidents (scratches, bumps, bruises, etc.) Inform children about what can happen if they do not respect summer safety rules. You could also add a policeman or fireman costume. Why not have an "at the beach" corner? All you need is a sand box, towels, empty sunscreen bottles, hats, caps, bathing suits, swim aids, boogie boards, etc. Another way to review water safety! A "weather station" area is perfectly suited to the theme too. A thermometer, a container to collect rainwater, a barometer, weather pictograms, a weather vane, a map, a television, and a microphone can all be used by children to present the day's weather, just like on television! This is perfect for telling children what to do if there is a thunderstorm. Memory or association game with educatall pictures. Modeling dough with bright colors...just for fun! Books about summer and summer activities. A radio, headphones, and CDs with sounds of nature, waterfalls, or birds singing. Small games where children must find the errors. 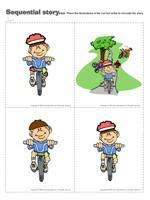 Various activity sheets to prepare older children for kindergarten. Games with educatall's word flashcards. Children lay on their backs and pedal as if they were on their bikes. Children sit in hoola hoops and pretend they are their rowboats. They pretend to row and fish with imaginary fishing poles. Children play follow the leader. The leader takes them on an imaginary walk in the forest...they must imitate his every move! Use your imagination, there are endless activities which involve motor skills in summer! Children sit in a circle. One by one, children name something they wish to add to the backpack to go on a trip. For example, they may say "To go to the swimming pool, I will bring my swim aids, my bathing suit, a towel, sunscreen..." or "To go ride my bicycle, I will bring my helmet, the first aid kit, a water bottle..." Variation: We have prepared a picture association game to help children identify the safety measures they need to respect to have a safe and fun summer. (Open picture game-Summer safety) Children take turns presenting a picture, a swimming pool for example. Discuss dangerous situations which may happen at the swimming pool. Ask children who has the picture which shows the safe way to have fun at the swimming pool (the child wearing his swim aids). Deposit three hoola hoops on the floor next to each other (or trace circles with rope). Children stand in a circle around the hoola hoops. One at a time, they must jump in the hoops to the sound of music. When the music stops, the child who is in a hoola hoop is imprisoned. He must swim like a fish to free himself. Name a situation where it is important to respect safety guidelines. Children take turns mimicking the actions which will keep them safe. Example: for swimming, children could walk slowly, put their swim aids on...The rest of the group tries to guess and name the actions. (Open traffic lights and signs) Draw a giant city on your driveway with your group. Depending on how much space you have, you could include streets, a grocery store, a bank, a playground, a daycare, a school, etc. Add traffic lights. Children will enjoy riding around the city with tricycles or small cars. When you show the green circle, children move about the city, when you show the yellow circle, they slow down, and of course, they stop when you display the red light. Alternate the different lights. Ask your local grocer for a few empty cardboard boxes. Children decorate them to look like rowboats. Before sitting in their rowboats, have them put on a life jacket. Give them each a fishing pole (stick with string and a magnet). Let them fish for paper fish with metal paper clips attached to them. With children's help, gather everything you need to build a shelter which will provide shade. Build it outdoors. Be creative and organize games which can be enjoyed under your shelter throughout the theme. Choose a location which is not too far away and organize a walk: forest, pedestrian path, etc. Before leaving, ask children to help you prepare your bag with everything you need to make the outing safe: a compass, a water bottle, a first aid kit... Once in the forest, explain safety rules: watch where we are going, not to taste anything, to stay together... As a group, find ways to find your way back. Show children how a compass works. Organize a bicycle outing with parents. Before your departure, invite a policeman to visit your group and review bicycle safety rules with the children or print the following document. (Open bicycle safety) Use bike paths and pedestrian crosswalks. Make sure all participants wear a helmet. (Open hunt and seek - Water safety) Print and laminate. Children pick illustrations and try to find them in the larger picture. Print, cut out, and laminate. (Open story and memory game - Summer safety) Place the illustrations face down on the floor. Children pick three cards and invent a story in relation with the illustrations. Variation: To solidify the cards, glue them to the top of frozen juice cans. Use as a memory game. (Open sequential story - Summer safety) Print the story, laminate it, and cut out the illustrations. Children place the illustrations in order. Write the word DANGER on a red piece of cardboard and the word SAFE on a green piece of cardboard. Have children cut pictures out of magazines, flyers, catalogues, etc. Next, have them glue the things which are dangerous on the red cardboard and things that are safe on the green cardboard. Leave their work on display. Children can add to them throughout the theme using pictures they found at home. Deposit a box containing a picture in each corner of the daycare. Send a child to each corner to look in the boxes. Children come back to the group and tell their friends what they saw. They must also determine if the pictures showed something safe or dangerous. Put four new illustrations in the box and start over. Suggestion: use the illustrations found in the educatall picture game. Deposit swim aids, a bicycle helmet, a life jacket, knee protectors, etc. in the center of a circle. Children pick a card without showing their friends. If, for example, they pick a picture of a bicycle, they must take the bicycle helmet and the other children guess what they picked. 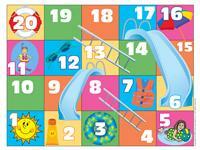 (Open snakes and ladders - Summer safety) Print and laminate. Use a die and small pawns to play. Each day, name a child to be the security guard. He is responsible for making sure everyone respects safety rules during activities. If a child forgets a certain rule, the security guard must kindly remind him or tell an adult. Get your first aid kit and have children find a partner. One child plays the role of the injured person and the other one is the first-aid worker. Name an injury: broken finger, scraped knee, twisted ankle, etc. Using the items found in the first aid kit, children help their friend. Explain and demonstrate the proper care for different injuries. This is the perfect activity for a hot and sunny day! Gather items which float and other items which sink. Children will enjoy guessing whether the objects will sink or float. Discuss the importance of wearing a life jacket. Make tiny fishing poles using small branches, bits of yarn, and a clothespin attached to the end. Hide behind a table. One at a time, children cast their fishing line on the other side of the table. Attach a tiny "Ziploc" bag containing a snack. Alone or in groups, children create a poster for the safety theme. They choose the theme of their choice: riding a bicycle, walking in the forest, going to the playground... They must illustrate the correct actions and the appropriate material or equipment they must have depending on the activity. When they are done they can present their poster to the group. Ask parents to provide an old hat or an old baseball cap. Each child decorates their hat as they wish using sparkles, pieces of fabric, fabric markers, ribbon, etc. You can make holes to fasten small details or use hot glue. Children can use their hats to protect their heads from the sun. 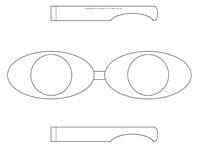 (Open craft - sunglasses) Print the model and trace it onto heavy cardboard. Children decorate their sunglasses. Give each child three small paper plates. Have them paint them red, yellow, and green. Next, children glue their plates on a piece of black construction paper in the correct order so it looks like a traffic light (green, yellow, red). Variation: (Open traffic lights) Print and have children glue them onto an empty paper towel roll. Children can use them like policemen or school crossing guards.